While Nintendo still prefers conventional approaches to selling games — you pay a price and receive the full game — it has, in recent times, shown an increasing willingness to explore areas such as DLC. It's also, to a lesser degree, explored and supported free-to-play — Steel Diver: Sub Wars is a notable example on 3DS, while Zen Studios adopted an app approach with Zen Pinball 2. We haven't seen a flood of these games, but there is another on the way to North America next week. 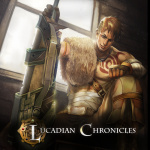 Lucadian Chronicles — from Dark Roast Entertainment — is a virtual card game that's coming to the Wii U eShop in North America on 11th December. The studio moved to issue some clarifications when its official listing appeared on the Nintendo website with a price of $0.00; its tweets have confirmed that it'll be a free download with limited content and an unlock of $7.99, though gave assurances that there'll be no microtransactions. 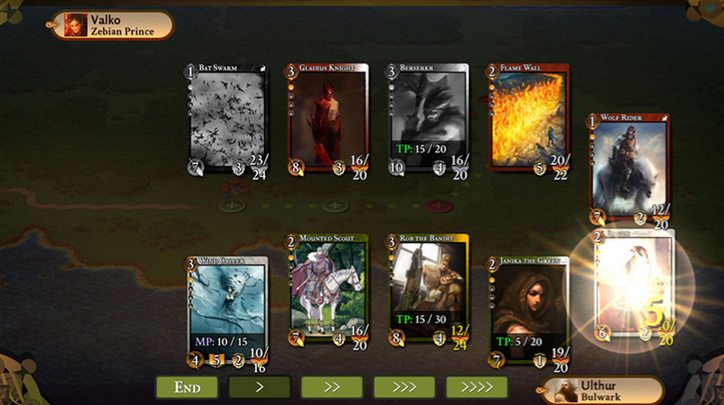 With a card game like this — which will apparently also include online battles — it seems sensible to offer a free version for curious gamers to try out. As a model it runs the risk of achieving a lot of free downloads without converting those into sales, all without the alternative revenue found on iOS and Android in the form of advertising. It'll be interesting to see whether this move pays off for the studio. Does this idea of a free download and a paid unlock to access more content appeal to you? Let us know in the comments below. I will have to give this a shot. I like that it's using the Steel Diver model. The Wii U badly needs more games of this nature, especially given the rather large number on the PS3, X360, PS4, and XBO. I wouldn't probably try it otherwise so yes it's a good move. If it's on my system it runs a better chance of being purchased then not. Anything on a Europe release? I'll definitely give it a try once it comes to Europe. I like card games (Pokémon Trading Card Game, Hearthstone, Triple Triad, Chocobo Tales card game). If this is any good I'll gladly pay 8€ for full game. Game sounds cool, looking forward to it. Still waiting for Hearthstone on WiiU... would be perfect with the Gamepad! Because there is a free version I will try it, but generally speaking this is not a style of game I care for so it would need to be something spectacular to get a purchase. From my understanding this game also has some sorta Miiverse integration. It was shown on Gonintendo awhile back. Fine by me. I'lll get the free client day one, and if it's any good, I'll get the full thing right afterwards. I hope this move pays off for them, because it's classy. It pays to be clear, no hidden/extra costs. Wish the best to them, will definitely check it out. Wii U also has Tank! Tank! Tank! which is sort of free and limited, more like a demo than this I guess. I still have it on my menu but the kids and I couldn't get into it, not even when I rented the full version from Gamefly. Sounded great on paper but was only fun for very short periods of time. More games are always good though - free, free-to-start, microtransactions - I don't care, just let Wii U get some games, somebody will want them and the rest of us don't have to play them. @rjejr I ended up purchasing the single player campaign for Tank! Tank! Tank! because it just seemed to call back to both an older age of arcade machines and the old "AA" titles of the past that just explored goofy concepts. Sort of like the few Simple 1500 or Simple 2000 games that made it out of Japan. I like this version of F2P. It's a fundamentally solid scheme. It bears almost no resemblance to the nasty type of game on mobile devices that shares is name, however. Functionally, it's similar to a demo. Oh man! I want to play. Hopefully it's coming to Australia or at least the UK eShop soon. I've never even heard of this game, so I'm wondering why they're trying to bring it to WiiU, not that I mind, though. But giving up the F2P factor is gonna bite them, I fear. All the online stuff relies on a steady income through either ads or microtransactions. Upholding servers for online card battles with a 7.99$ price tag doesn't sound realistic at all. JUST GIVE ME PTCGO WII U NOW!!!!! I love these kind of games, I really hope it makes its way to Europe. I don't know if I'll buy it, but I'll definitely try it. I love a good card game, and the Wii U is a great fit. Card game? I'll pass, sorry. Card game? yes please, where do i deposit my money? This is a kind of model I've been advocating for third-party developers to follow. I usually only played Activision, EA and Ubisoft games for the campaigns - seldom for achievements, trophies or leaderboard positions. If I got the campaign for free but be forced to pay for achievements and all the online goodies, sure, I'd pay full price for a game like that. That's continge on whether or not I like the game, but I'm not TOO hard to please. Don't get me wrong, I'm no advocate for vapid storytelling with blatant sexual imaging, but a game just needs an engrossing enough narrative without going over the top. Hopefully that's not too much to ask. This model of selling games is approaching the classic idea of shareware, where you're given enough of a game for free to have fun, but for a premium there's more to be had. It's a model that has been quite popular on OUYA, for whatever that's worth. @Pod Shareware still exists to an extent but is generally crippled by console makers. For example, Telltale Games gives you episode one of their series for free in an attempt to hook you on it for episodes two-five, on everything but consoles. On just about every platform but Nintendo, Zen Pinball 2 gives you a free table to start with. There are others out there to, and that is not even touching on Xbox Live Arcade's policy of requiring demos. @Captain_Gonru - Mario Super Sluggers on the Wii was actually a good baseball game. Besides having a built in lite RPG mode (I'm a sucker for open world wandering and open world hub areas, that sort of thing) the games had enough to keep me happy - team selection, changing pitchers, assigning positions. OK, maybe having trains and an attack octopus in the outfield wasn't realistic, but I would really like a Wii U Mii Baseball game where I could choose teams and stadiums and assign positions. Wii Sports Club baseball has what, 3 innings? Baseball has 9 last I checked. Heck let the amiibo unlock players, people are looking for an excuse to buy them. It's a Day 1 buy if we ever get it. I haven't paid $10 for Sports Club baseball yet b/c 3 innings is 6 too few. If the game is good and gets buzz then no worries, but that's true of anything. I do think a demo for a game like this is a must. I'm looking forward to checking this out, as I like card and strategy games. If it is collectible card game, I hope they don't make collecting everything too grindy (i.e., must perform repetitive tasks (or log in long hours of normal play) that are usually monotonous in order to unlock new items). If the strategy is good and the user interface operates well, I'd buy in. Appreciate the one time cost over dlc, as that could ruin the balance of things in a strategy game, though optional dlc (such as customized looks/appearances kind of items, preferably at reasonable prices) could work, for those who really get into it. @Captain_Gonru - Oh great, now this page is orange also. Guess it's the Wii U eShop color. Sports Club is $60+ on Amazon, guess they ran out of stock. And it looks like $40 everywhere else I shop. I think part of the problem I have w/ that price is it's so similar to a game I got 8 years ago for free which sold for $20 and now it's $40. I know the new game has online but I don't play online b/c I don't know anybody who owns a Wii U. Maybe when my sisters get a Wii U and the game for my nieces and nephews I'll pick a copy up, should be $20 by then. A fully playable game that gets larger if you pay it not necessarily the same as a demo, but I see what you mean. I am definitely not a fan of requiring demos, though. @Pod It depends on the demo for me. I find that it has been a long time since I last really had faith in reviewers, there are too many conflicts of interest that happen. Most gamer journalists ultimately behave only slightly better than amateur bloggers with special access, and we generally don't know what compromises are made for that special access. Not an idea situation with a product I cannot return for a refund. So there are demos and waiting for the fallout to hit from a game release. There was a time when I would purchase games based solely on publisher, such as buying anything that had Squaresoft on it during the PS1 era. Sierra, Capcom, Konami, Square, Nintendo, Lucasarts, and at one time EA carried a reputation for quality for me. Of those companies, only Nintendo remains as one that I am willing to purchase without hesitation because regardless of whether I like it, it will be a quality product most of the time. The rest, I end up waiting for others to purchase and then once the smoke clears I see if the game still is standing. EA did at one point mean something to me too. Of course that was back in 97 before all their greatest studios fell apart. It's not that I particularly trust reviews over demos, but demos can be deceiving as well, and can leave you with an extra decision to make: Do I like this enough to pay for the whole thing, or was this taste enough for me? Often I find myself voting no on games where I might have played the whole thing, had I bought it up front. Meaning I get an amputated experience. It's entirely my own doing, I am aware, but so is everything people get upset about concerning video games. @Pod See I find it the other way around. I tend to buy more games that can hook me with a solid demo. Doom, Torchlight, Metal Gear Solid 1 & 2, Tony Hawk's Pro Skater 2, and The Stanley Parable were all purchased because of awesome demos. Played this last night and was disappointed. It requires a persistent internet connection and I was frequently given errors that let to the game crashing. Also the gameplay was a little lacking. I never would have tried this game if not for the free demo - and that would have been my loss, it's a great little game and playing has convinced me it's worth buying. Well done to the developers for putting this together! Is this ever coming to Europe?